What if individuals with intellectual disabilities had access to sport? What if they could compete like their typical peers? What if fitness became a way of life? The late Eunice Kennedy Shriver understood the importance of, and need for, more physical activity for people with intellectual disabilities. What if children with intellectual disabilities were given the opportunity to kick a soccer ball and swim in a pool, just like everyone else? In 1960, she held a small summer camp in her backyard, bringing in counsellors and watching the fun and fitness unfold. But what if they had access to better fitness? Would health improve? Hayden began his research and not surprisingly to us today, his research proved that better fitness levels were as attainable for this population as any other. Better fitness would mean better health. His ground-breaking research proved that it was the exclusion from sport and fitness that caused the health problems, not the disability. As a result of this research, Dr. Hayden proposed a national games for the intellectually disabled. His research and proposal came to the attention of Eunice Kennedy Shriver. Now, she had scientific evidence to support what she had observed and knew to be true. It was the summer of 1968. 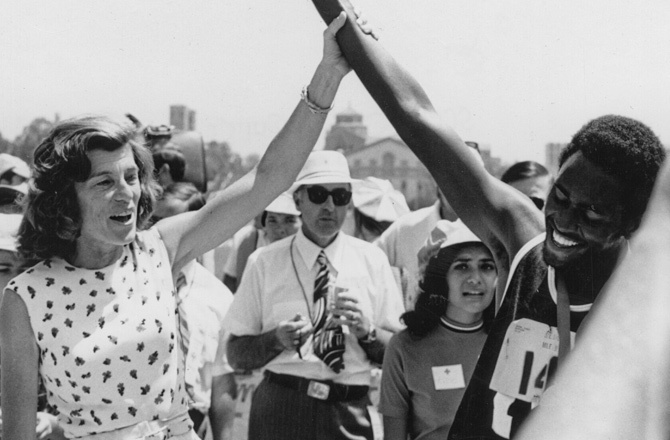 Eunice Kennedy Shriver hosted the first Special Olympics at Soldiers Field in Chicago. It was an International Competition – Canada sent a floor hockey team, accompanied by Dr. Hayden and Harry “Red” Foster. The 2 men watched from the sidelines and were moved by the effort and passion of the athletes and their coaches. What if we brought this home?, they reportedly asked. The following year, 1969, thanks to Foster’s tireless efforts, Special Olympics in Canada was born. London began its programs in 1986 and quickly became and remains today, a leader in community programs.